Rowing is traditionally associated with lazy bucolic days messing about on a lake, but ocean rowing is conversely an altogether more demanding feat. Ocean rowing an extreme sport whereby competitors push their physical and psychological powers to the limit by rowing across oceans. It is not a popular sport, as the vast distances and long periods at sea at the mercy of nature mean it is a heroic and dangerous pursuit that only attracts the most hardy and foolhardy of individuals. As such, its great feat of human endurance, strength and mental discipline has led to ocean rowing being touted as ‘the new Everest’. The history of ocean rowing is usually divided up into two categories – the historic and primitive ocean voyages and the technological sophisticated modern rows. The sport of ocean rowing was established in 1896 when two Norwegian fishermen made the first successful rowboat ocean crossing from New York to Le Havre, France in 55 days. Their 3,250 mile journey defined the primitive period, as they used only the stars to guide them, had no proper form of shelter, only a small amount of food and only rainwater for hydration. It took another 70 years before the next ocean row was attempted but despite the gap the journey from Cape Cod to Ireland was a similarly primitive endeavour. These first attempts, along with subsequent ten together form the ’12 Historic Ocean Rows’, as they were completed with very limited if any modern technology. 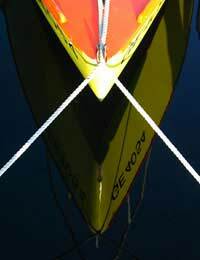 Advancements in boat design, preparation weather predictions and navigation that are standard of the ‘Modern Day Rows’ have attracted greater numbers of hardy souls to the sport in recent years, and to date there have been several hundred successful attempts to cross the oceans of the globe. The majority of the crossings have taken place on the waters of the Atlantic as part of the Atlantic Rowing Race. The Atlantic Rowing Race is the most famous ocean rowing event, and largely responsible for the sport’s higher profile in recent years. The event begins in the Canary Islands and concludes in the West Indies, a distance of approximately 2,930 miles. It was first staged in 1997 and has been held roughly every two years since. To date a total of 153 individuals have completed the voyage. Although it’s common to picture challengers rowing across vast oceans in a creaky wooden rowboat like one might find at a local park, the modern day rows are undertaken in very sophisticated vessels. These rowboats are typically lightweight, self-righting, shaped to move easily through turbulent waters and capacious enough to shelter two people and hold several months of provisions. When planning an independent ocean row, the powerful and unforgiving nature of the ocean environment means that there is no choice but to allow the prevailing winds and currents to dictate the journey course. An east to west North Atlantic crossing, for example, should take advantage of the equator’s trade winds (winds patterns around the equator) and currents by following the lower latitudes, with the return trip diverting to the northern latitudes. With so many potentially ruinous climatic factors outside of an ocean rower’s control it is important they pay particular care and attention to the time of year it is embarked to ensure a safe and successful voyage by avoiding local stormy and hurricane seasons. There is no ideal time for an ocean voyage, this purely depends on where the trip is being undertaken. For example the Atlantic Ocean Rowing Race that covers the distance between the Canary Islands and the Caribbean, would be best attempted between November and April but this might not be the ideal time for a ocean journey in other parts of the globe. This season voyage scheduling becomes even more complicated when a trip takes in many degrees of latitude. For instance the accurate timing of a row from Portugal to Costa Rica is crucial because departure in fair summer conditions could mean arrival in unsettled stormy weather. Unfortunately such cautious planning can be reduced to nothing with the increasingly erratic effects of global warming, which has resulted in some extreme atypical seasonal conditions. Rowers are therefore advised to be extra vigilant in charting pre-voyage weather trend anomalies. Nevertheless a well prepared ocean rower should always travel complete with pilot book and charts, which offer useful weather data studies and provide information on ocean currents and average wind directions and speeds.